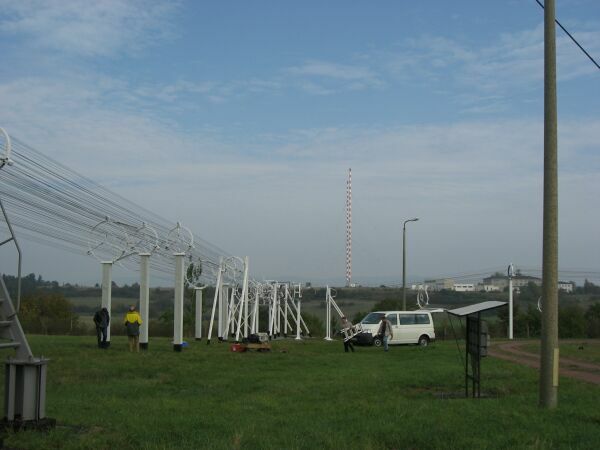 directional antenna, consisting of four masts (each 125,1 m high) insulated at the base. It is a lattice structure of tubes with a triangular shape. 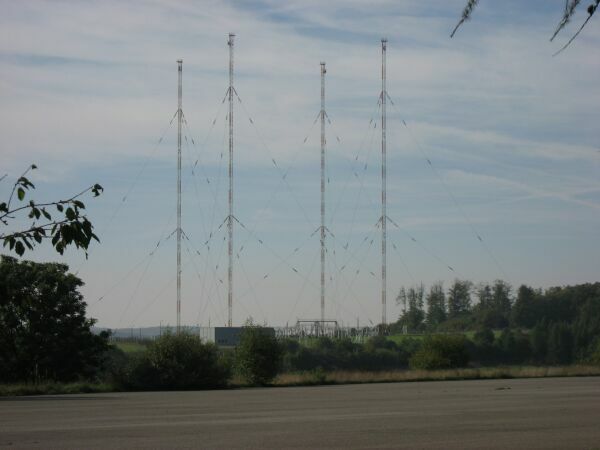 The antenna with four masts was designed and developed by Russian engineers. 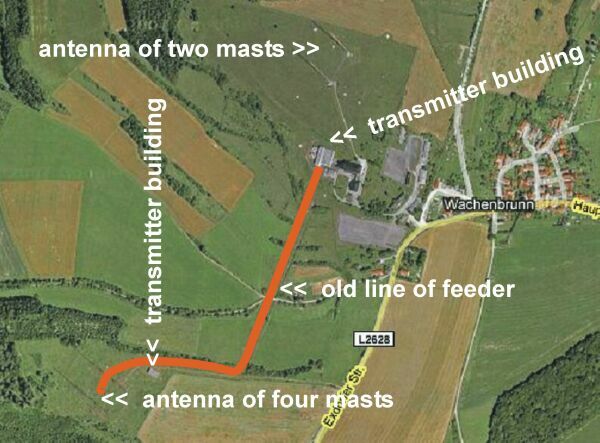 In the beginning the transmitters of both antennas were located in the transmitter bulding which was more close to the village of Wachenbrunn. 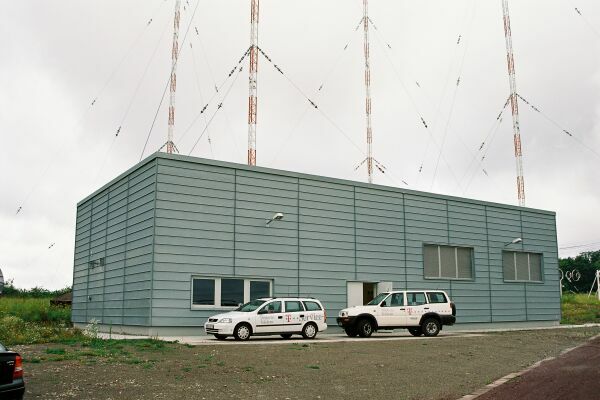 During modernization in 2002 and 2003 a fully transistorized transmitter of 1000 KW was installed in an old stockbuilding close to the antenna of the four masts. Greater parts of the old feeder line ( above indicated in red ) became obsolete. 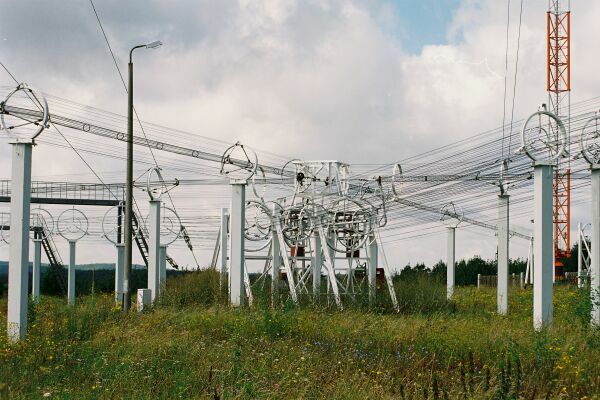 A transformer was installed to cope with the new situation. 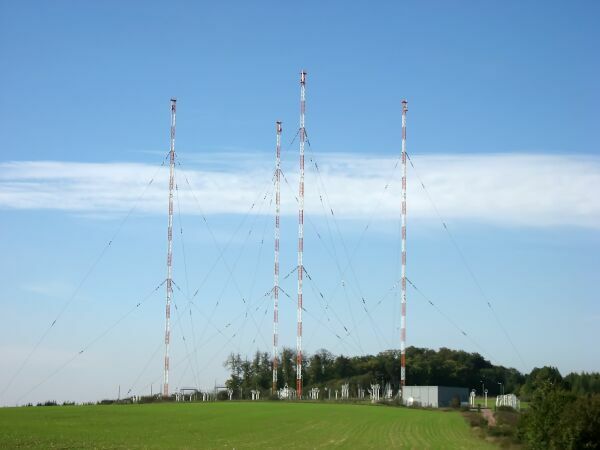 It enabled the adaption of the new transmitter near the antenna to the old antenna system. The leakage path of the base insulator is large as the voltage is high ( also because the height of the antenna is about lambda/2). The Russian engineers did not provide a rain shield. 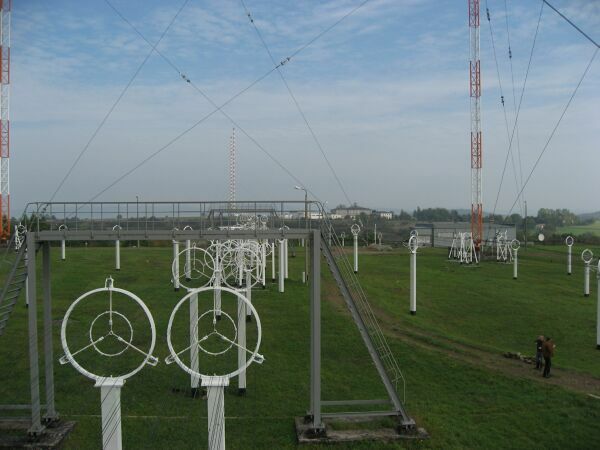 Using coaxial feeder lines is very characteristic for Russian antenna design. 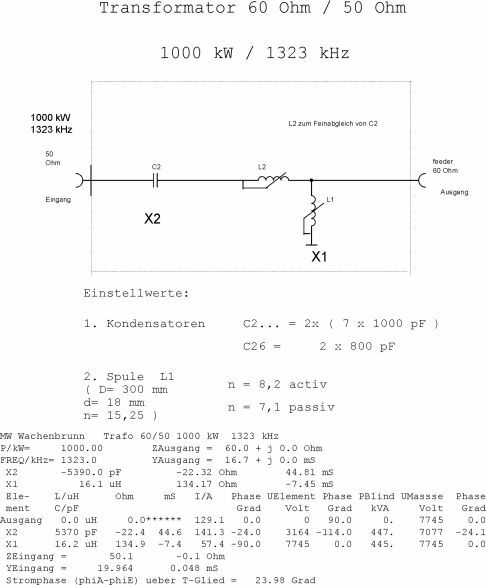 This kind of coaxial lines is also taken for tuning the antenna system. Such a line short circuited after a certain length is called a stub and represents a reactance transforming the impedance. The upper of these three photos shows the power distribution point. At the top of this junction the four lines are going to the masts. The transmitter power is coming from the right side of the photo. Additional coaxial feeder lines which can be seen are stubs for tuning the antenna system. Stubs are lines short circuited at a certain length and providing the necessary reactance. 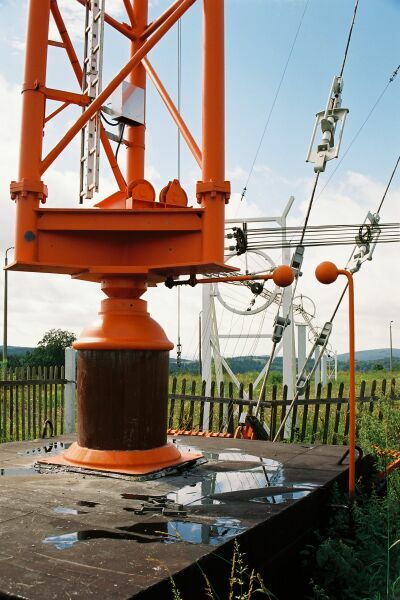 The second photo shows also the power distribution point with the lines to the four masts. The transmitter building on the right side and the two mast antenna in the back. An interesting detail is the crossover of the feeder line. It was installed to prevent people from going under the feeder line when the antenna is operating. It resembles a railtrack bridge. 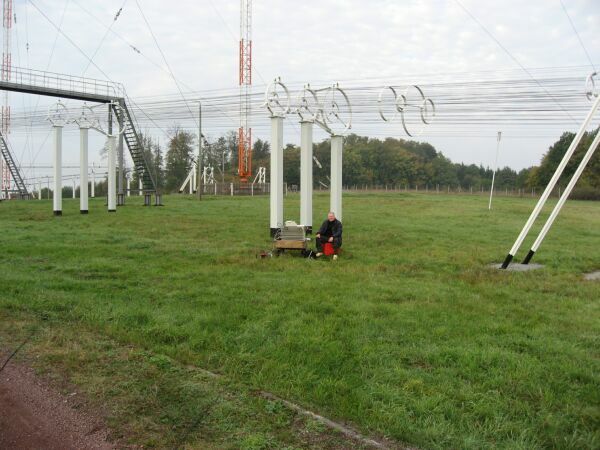 The lower photo shows a crew of TELEFUNKEN (today TRANSRADIO) modifying the coaxial feeder lines to adapt the new transmitter in the new building to the old antenna system with four masts. The two mast antenna can be seen in the back. TELEFUNKEN's "dinosaur" Fred Eberhard measuring the new settings of the modification. Once again a total view from a farer distance.